A group means 12 or more persons. A booking for a group may not be confirmed until we have received a 50% non-refundable deposit. Payment of deposit implies acceptance of group and normal booking conditions. The balance of the booking is payable one month prior to arrival. Cancellations made within 1 week of arrival will result in your group being charged for the full stay. Group "no show" will also be charged in full back to the group. Changes of up to a 10% decrease in numbers of the original size can be made without penatly, provided we are notified a minimum of 1 week prior to arrival. Any request to increase the group size will be accommodated subject to availability and the group will be charged accordingly. The balance of account for a group is to be settled by a single payment on departure unless other arrangements have been made in advance of arrival. More than 7 days prior to arrival - a 10% cancellation fee will be incurred to cover administration costs. Where we have pre-booked chargeable activities on your behalf, cancellation charges will be as per the operators’ cancellation policy or a minimum of 10% - whichever is higher. Our on-site facilities are available to our departing guests after 10:00 a.m. though facilities may be closed for cleaning around 11:30 a.m.
Facilities are for in-house guests only. Visiting friends of guests are welcome to be entertained in our restaurant. Guests are not to monopolise shared facilities to the exclusion of others. The hot tub may be closed for short periods for water treatment. It will periodically be closed for a 24 hour period to drain, refill & reheat and so use of the hot tub cannot be guaranteed. There is a general quieten down time on site of 10.30 pm. 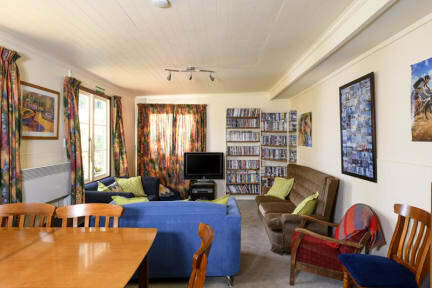 At this time we ask guests to turn down the stereo in the communal lounge & also the TV room. Guests need to have consideration for other guests, especially young children who are trying to sleep in their rooms and not ‘congregate’ outside of rooms. Excessive noise or anti social behaviour will not be tolerated at any time. Where your behaviour is such that other guests have to be recompensed, or leave early, the cost will be passed on to yourself. The BBQs, tables, chairs, benches, sunshades etc that we provide on site should be left in position. Guests are not permitted to bring their own furniture or BBQs onto site. Vehicles should be parked in the designated areas. Your personal possessions are at all times your own responsibility. This is regardless of whether items are in a locked room, communal area or in your own vehicle. The BBQs, tables, chairs, benches, sunshades etc that we provide on site should be left in position. Guests are not permitted to bring their own furniture or BBQs onto site. There is a public area on the DOC reserve by the lake which is suitable for such purposes. Vehicles should be parked in the designated areas. Guests are not to monopolise shared facilities to the exclusion of others. Nestled next to Lake Wakatipu at the foot of the mountains, we're a wilderness lodge for those looking to get back to nature and escape the towns. Hosting guests since 1868, we provide all the modern conveniences such as a fully equipped kitchen, TV room, book exchange, communal lounge and bbq whilst in a remote setting. 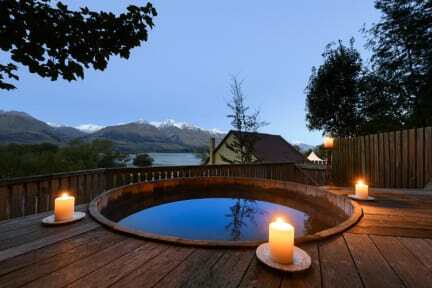 For true relaxation the hot tub is a must. Our cosy historic restaurant provides a selection of local beers and wines, delicious home cooked fare and stunning views from the outdoor seating. Serving breakfast through to dinner, with hot drinks and baked goods available throughout the day. We can pack up a lunch for you to take out for your adventures if you need. We offer track transport to nearby walks and provide luggage storage as well as a wet gear room for trampers. Fishing rods and bikes are available to hire and in the warmer months we offer kayak trips with a guide. Happy to help with any tour bookings and advice.